The FR2LE promises high‑quality stereo audio capture in a small and inexpensive package. Is it perfect for location sound recording? The Fostex FR2LE is something of a less expensive sequel to the popular Fostex FR2, and is a relatively inexpensive portable field recorder, coming in at a retail price of $599. This places it halfway between its sturdier big brother and the many less expensive pocket recorders on the market (as well as the Tascam HDP2). A far cry, then, from the high‑end esoteric field gear made by Nagra and Sound Devices, but certainly not a bargain‑basement recorder. At 57mm high by 206mm wide and 132mm deep, the FR2LE is a little smaller than I expected, and about half the size of the original FR2, a recorder I've been using since it was released and am, for the most part, very happy with. The FR2LE is delivered with a carrying strap, 'wall wart' power supply, remote control, draw‑string carrying bag and instruction manual. As the FR2LE is much thinner than the original FR2, the display has been moved from the front panel to the top. Replacing the display on the front is the Compact Flash (CF) slot, underneath which are situated the microphone trim controls and the monitor level control. To the right of these are Fostex's standard Rec Stby (for record standby') and Rec buttons, with their operation lights and LED level meters above. These LEDs replace the function of the front-panel display in giving a clear indication of levels when using the FR2LE over the shoulder. The dual‑concentric input level control is on the bottom‑right corner, to the right of the record button. This has been improved from that of the FR2, and is easier to adjust with the thumb once the levels and balance are set. The top panel hosts the main, backlit LCD, which shows comprehensive data including time display, mode (stop, play, fast forward, rewind and record), take number, remaining time, level meters, date/time and battery status. To the right of the display is the main control panel with all the primary operation keys. Also on the top panel are two small holes, which contain a pair of small omnidirectional microphone capsules for 'note taking' purposes. On the left side of the unit are DC input and remote control sockets. The remote duplicates the Rec Stby and Rec buttons and also has a cue Mark button, plus a Velcro strip for easy fixing to the carrying strap or similar. The main analogue inputs are also on this side, and are presented as a pair of Neutrik Combo 3‑pin XLR/jack sockets. The XLRs are microphone‑level sockets and the jacks are line‑level sockets. On the right‑hand side is the main power switch. A quick flick of the switch turns the machine on, but it must be held in order to turn it off, a feature that helps you to avoid accidental power‑offs. A few more connections are here too, including a 3.5mm headphone socket, a USB connection for downloading data to a computer, and a pair of phono sockets for monitor line out. On the bottom of the unit is a small loudspeaker for confidence monitoring. It works fine for this purpose, as long as you don't sit it on anything soft! The back of the recorder hosts the battery compartment. This contains a plug‑in box that takes four alkaline or rechargeable AA batteries, for about four hours' running time. The box can also be replaced by a Tamiya 7.2V NiMH battery pack for about eight hours' use. If you use the Tamiya, a fast charger is available that can be powered from the mains or via a car's 'lighter' socket. My choice would be to use the FR2LE with the Tamiya packs and a fast charger, and to save the less powerful AA battery box for emergencies. The FR2LE has recording and level controls on the front face, so they're easily accesible when using the unit with a shoulder strap. The FR2LE is a versatile machine, capable of recording in many modes. These range from 192kbps MP3 up to 24-bit, 96kHz BWF (Broadcast Wave format) and almost everything inbetween. Although the FR2LE is superficially very similar to the FR2, it does do things a little differently. As the machine is so much smaller, a lot of the setup is carried out using the menu system. This can lead to slip‑ups if you're not careful: I made a very interesting recording using the internal omnidirectional mics, simply because I forgot to enter the menu and select 'input'. I still had the machines set to 'I.Mic.H' (left internal microphone, high gain). Once you get used to the menu layout, though, it's easy enough to set up. The operation of the FR2LE's record buttons is a little unusual compared to that of most machines, but is great when you get used to it. Pressing the Rec Stby button puts the machine into standby mode, allowing you to monitor the incoming signal. If you have activated 'pre‑record' mode, the FR2LE also starts recording into its buffer memory. Pressing Rec starts the recording, first reading out the buffer onto the CF card, with the rest of the recording following. This is ideal if you don't want to risk missing the first word or note of a take. To stop the recording, you press Rec Stby again, the machine finishes reading the buffer memory onto the CF card and stops. One particular quirk of the FR2LE is the importance placed on setting up the Compact Flash card correctly. Each card can only be formatted for a particular sample rate, which means that you need to have several cards pre‑formatted if you often use different sample rates or channel configurations. Another quirk of the system is that you can't delete individual files from the card. You can only delete files by re‑formatting the CF card entirely (preferably after you have downloaded the files to your computer). At first glance these features might both seem like shortcomings, but the FR2LE was designed as a reporter's unit, reporting being a task where deleting files accidentally can be disastrous (I won't say what radio station engineers generally think of reporters!). In short, this setup really is the safest option for field work. Note that there's a need to take battery life into account where monitoring is concerned. The manual says: "The lower the output level of headphones or internal monitor speaker, the less power consumption.” It's important, then, to keep things efficient. The headphones I use are the Sennheiser HD 25‑1 which are 70Ω impedance and 120dB efficient, giving a high monitoring level for a low volume setting. Whatever headphones you choose for yourself, look carefully at the impedance and efficiency before choosing, as this will help to maximise battery life. 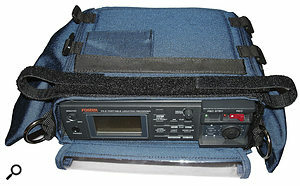 Fostex's earlier and more expensive FR2 shown for comparison in a PortaBrace carrying case. Note the front‑mounted screen. I really like the FR2LE, though it did take a bit of getting used to. Being accustomed to the original FR2, there were a few things that threw me at first but made working easier in practice, while some other tasks have become a bit more involved and not so easy due to the reliance on menus. The level control is certainly an improvement over the original FR2, being very easily adjustable, and the addition of a single button-press to return to the start of a recording is great for reviewing takes. I'd say that the FR2LE is the least expensive of the 'good' audio recorders that should be taken seriously for professional work. It doubles the battery life of the higher‑end FR2 from two to four hours when using four alkaline AA batteries and runs for eight hours using a Tamiya battery. This makes it seriously usable in the field, while the original FR2 needed at least the Tamiya battery to be of much use in extended sessions. For serious recording all you need to add is the Tamiya batteries and a good outdoor case from someone like KT Systems. The FR2LE does not replace the FR2 as such, since it has no digital input or timecode option; if you need these features you will have to get the original FR2, and if you do opt for the LE, you'll have to employ some other way of sync'ing your recordings to video. It's also not a pocket recorder, so the built‑in microphones are really just for 'note taking'. Although it was originally aimed at the radio reporter market, it fulfils an excellent role as a budget location recording machine. It's not too small and fiddly, but not too large to be unwieldy. Coupled with a pair of decent condenser microphones it will produce very fine results in many situations. Unlike its bigger brother, the FR2LE also comes complete with mains PSU, which is a boon in many situations. It can't match the build and exceptional recording quality of a Nagra but it's a fraction of the price, and sounds great for it. All in all, the FR2LE is ideal for the musician on location, the videographer who wants high-quality sound recorded off‑camera for sync in the edit, or even the wildlife recordist on a budget. The Marantz PMD 661 is a similar price (though I have not tried this yet), while the Edirol R44 is a four-channel recorder at a slightly higher price. 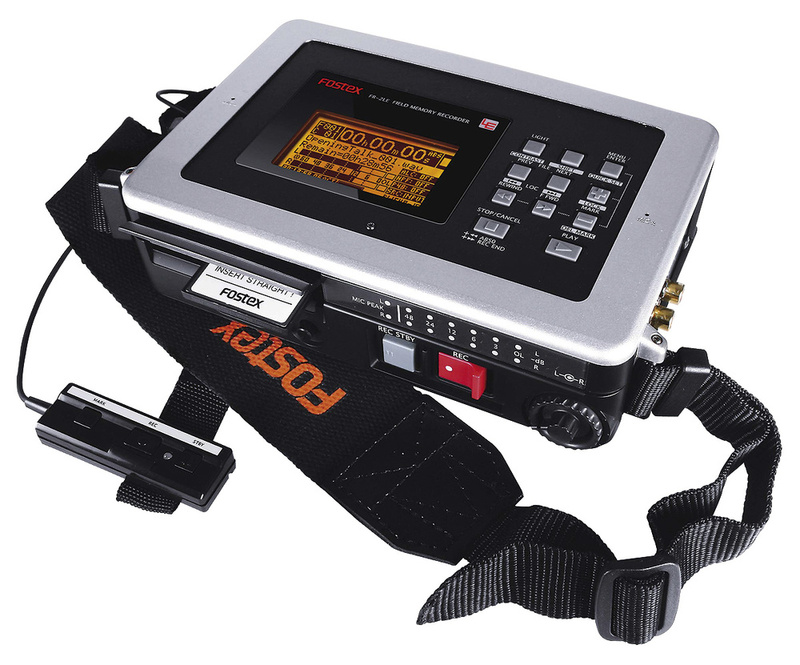 If you want timecode, the Tascam HDP2 or the original FR2 with timecode board are worth looking at, but at a higher price level for the features. XLR mic inputs with 48V phantom power. Memory buffer means you never need miss the start of a take. Good ergonomics and easy to use. No AES3 or S/PDIF digital ins or outs. The FR2LE offers 'professional' design at an affordable price, with decent XLR microphone inputs, 48V phantom power and good sound quality, while the record buffer means that you never need miss the start of a take. It's not a tiny, fiddly pocket recorder, but a unit that can easily be used for location recording. If you want a quality field recorder on a budget, it's well worth considering.